(NEW ORLEANS, LA) The primary travel teams of Arch Rival Roller Derby had an extremely productive trip to the Crescent City. At the third annual SweatFest invitational, hosted by the Big Easy Roller Girls August 4 & 5, the St. Louis-based teams collectively finished the event 4-1. 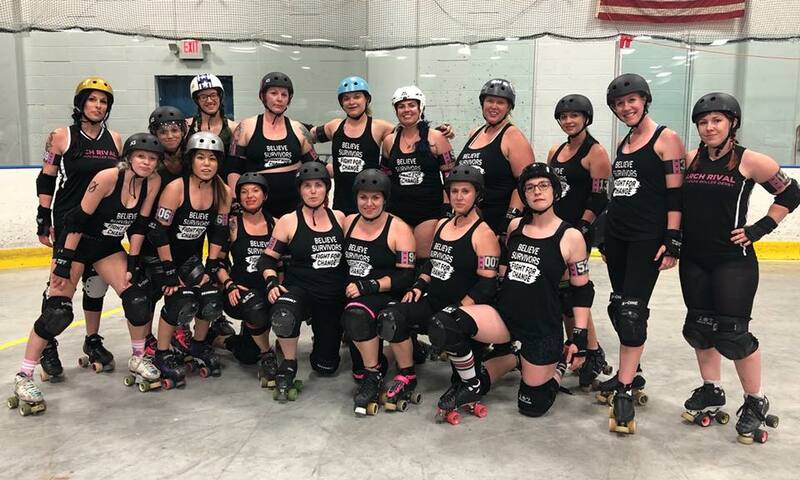 The Arch Rival Roller Derby All-Stars, currently ranked fifth internationally by the Women’s Flat Track Derby Association (WFTDA), claimed a two-game sweep with victories over #6 Texas (253-78) and #11 Atlanta (219-100) and pushed their record to 4-3. Meanwhile the league’s developmental b-team, the Saint Lunachix, ended the weekend 2-1 with victories over LA Nightmare (324-96) and Houston Knockouts (228-171) while suffering a 193-96 setback to the Texas Chainsaws. The SweatFest output resulted in the Chix finishing their 2018 with a record of 3-3. While the points were extremely bountiful for both squads this past weekend, the key MVPs for the respective squads were the blocking battalions that provided the walls for ARCH jammers to break through while holding the opposing jammers to minimal scoring passes. For the Arch Rival All-Stars, that included veterans Smarty McFly, Bolt Action, Shear-Ra Powers, Cloak N’ Drag-Her, Vicious Van GoGo, Jamheiser Bush, Kayla Woodward, Grant, LuxFurious, Pegasass, Fletcher and others. Meanwhile for the Saint Lunachix, blocking was paced by Rock Slobster, Cruella Belle-ville, Birdsong, Splatter, Pixie Dust-Ruction, Lethal Dose, Trigger Happy Jackie, Rude-Off, SheKill O’Neal, Girl Fawkes, Carmina Piranha, Joan of Spark and others. The Arch Rival All-Stars begin their WFTDA post-season journey as the top seed of the A Coruna, Spain playoffs that begins August 31. Saturday’s meeting saw St. Louis cobble a 32-0 rally early en route to a dominant win. Trailing 2-0 after the opening rotation, Arch Rival claimed lead jammer status in the next five flights that foreshadowed a triple-digit triumph. Annie Swanson’s 11-point strike in Jam 2 was followed by Psychokid D’Freakout’s grand slam four minutes deep that pushed ARCH’s lead to 16-2. D’Freakout’s four-pointer finished the aforementioned run as St. Louis possessed a 32-2 lead with twenty minutes remaining in the half. ARCH widened their lead to 75-27 with Reptar’s 14-point collection with 3:10 left in the period. Arch Rival possessed a 95-41 lead at intermission and proceeded to put the pressure on the Dirty South Derby Girls early in the second half. Saturday’s launcher for the Lunachix began with a 22-0 sprint out of the gates. As the period progressed, the differential widened and ARCH sported a 128-41 lead at intermission. The Lunachix overwhelmed the Nightmare in the second period, 196-55, en route to the 228-point victory. The 324 points accumulated was the third-highest in the franchise’s ten-year history. The Lunas picked up their second win of the weekend with the 57-point triumph over the Houston B-squad Sunday morning. Trailing 57-54 with eleven minutes left in the first period, Arch Rival flipped the scoreboard with Flash’s nine-point strike that gave the Lunachix a 63-59 lead with 9:45 left in the frame. The Jukes on You then added 14 points on the next rotation that pushed the score to 77-59. As St. Louis sported a 94-80 lead at intermission, they claimed a pair of powerful jams out of the gates to start the second period. Jedi Knight-N-Gale launched the half with a 22-11 push that extended the lead to 116-91. The Lunachix then capitalized on a power jam on the next flight and Ultraviolet collected 15 uncontested as St. Louis pushed the score to 131-91. The ARCH b-teamers outscored the Knockouts in the second, 134-91, en route to the 228-171 duke. The St. Louis squads’ second Sunday game against a Lone Star State rep saw the proverbial perpetual mountain to climb as the Chainsaws claim an early advantage early in the first period. Five minutes deep, the Texans sported a 14-10 lead, but then In Jam 6, Chainsaws’ jammer Thugs Bunny collected a 22-12 rotation that widened the lead to 36-22. Texas pushed the score to 70-46 heading into Jam 20 and then Bunny scampered a 20-point strike that widened the lead to 90-46. For the rebound, ARCH’s Flash claimed a 15-1 period-ending jam that drew the score to 91-61 at intermission. The Lunachix were able to close the gap to 91-71 four minutes deep into the second half but Texas went on a two-jam 30-0 run that foreshadowed victory. Highlighted by Bunny’s 19-point strike with 23:25 left, the Chainsaws pushed their lead to 121-71. Texas’ defense proceeded to put the clamp down on the Chix offense for the final twenty and, in the end, outscored St. Louis 102-35 en route to the impressive 97-point win. Arguably, the most eye-opening result of the weekend was the featured marquee match-up between teams ranked globally side-by-side. 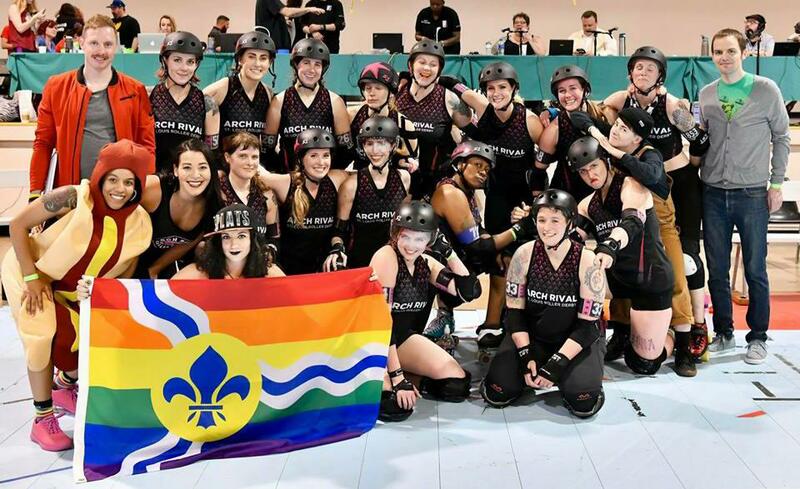 St. Louis’ first-ever historical win over the Texecutioners , a WFTDA legacy franchise, was launched by a 27-0 run over the first six jams. ARCH jammer Bricktator claimed 22 of those points in that opening sequence. Arch Rival pushed the lead to 40-9 with 14:25 left in the period and then went on a soul-crushing 53-0 run over the next six minutes. Bricktator started the rally with a 24-point jam collected with 12:50 left in the frame that made the score 64-9. D’Freakout added a 20-point power jam in Jam 15 that widened the score to 87-9 with 9:25 left in the period. When the dust settled on the rally that was concluded by Reptar’s six-point strike with eight minutes left, ARCH held a 93-9 lead. Leading 132-30 at intermission, Arch Rival continued to put the pedal to the metal in the second period. A 45-0 run helped solidify St. Louis’ dominance that resulted in a 193-43 lead with 13:00 left. Arch Rival outscored Texas, 121-48, in the second period en route to the 253-78 thumping and complete the Big Easy sweep.